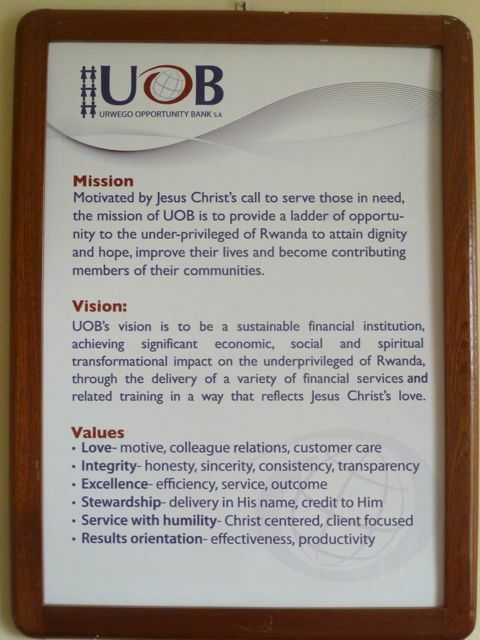 Before coming to Rwanda, we both had no idea what it meant to work for a Christian bank. Islamic banking, yes, that is something we had heard about before. But Christian banking? To find out more, we interviewed the staff at our host microfinance institutions, Amasezerano Community Banking, Vision Finance Company and Urwego Opportunity Bank, and asked them five questions. Question 1: Do you pray at work? That is a definite yes for all three banks. Amasezerano holds daily devotions from 7 to 8 AM at the head office and all of the branch offices. Vision employees are allowed to sleep in a little longer. There, the daily devotions only start at 8 AM. At Urwego, devotions take place every Monday and Friday from 8 to 9 AM. All staff, from manager to driver, are required to participate. Devotions start with a song, which is followed by the reading and discussion of a bible verse and prayer. Question 2: Do you have to be a Christian to work there? Yes again. And calling yourself a Christian is not enough; you have to be able to prove it. All three banks require a pastor’s recommendation from job applicants to demonstrate that the potential employee is actively involved in a church. Employees at Amasezerano, which was founded by African Evangelical Enterprises, have to be Protestant. Not all employees agree with this requirement as one of our interviews shows: “A pastor is not an authority that can speak in the name of God,” we are told. In general, most employees do agree, however, that it would be difficult for a non-Christian to participate in the required religious activities. Job interviews also include questions about religion that would make any average American or European HR department get up in arms. “I was asked how I would act in a conflict situation and refer to Christian values in my answer,” Alphonse, Kiva coordinator at Amasezerano, tells us. Question 3: Do you have to be a Christian to be a client? No. Since Rwanda is 93% Christian, naturally, most clients are Christian. But, as a quick look at the Kiva portfolio of the three institutions shows, other religions are represented as well. Most notably, Muslims, who make up 5% of the Rwandan population, can be found among the clients. For some loan seekers, however, the Christian ideals can make a difference. “The clients feel that no matter where they are coming from they can be accepted. For example, if someone is HIV positive, they will still be told to trust that God will keep them alive, they should take the loan, and they must take their medicine and continue on living. It adds an element to the banking sector,” says an Urwego employee. Question 4: Are there any Christian loan products? Amasezerano offers a special loan product for churches and other Christian institutions called “Ganza Kingdom”. Clients benefit from an interest rate that is 3% lower than that for regular businesses. You can find one of Amasezerano’s Ganza Kindom loans here on the Kiva website. While Urwego does not have any Christian specific products, they do ensure all of their loans have some sort of positive impact. Each loan product is subject to the Product Fit test, which ensures that at least one of the following attributes is met: dignity, authority, security, adequate provision, purpose, hope and meaning, freedom and adequate boundaries, and authentic relations and love. After a loan has been disbursed, Urwego focuses on positive client transformation and offers training on business management, home financial management and health management. These lessons are offered through the lending staff at regularly scheduled meetings. Question 5: Does it make a difference for the employees? Kathrin Gerner is a Kiva Fellow (KF16) at Amasezerano Community Banking (ACB) and Vision Finance Company (VFC) in Kigali, Rwanda. Whitney Webb is a Kiva Fellow (KF16) at Urwego Opportunity Bank (UOB) in Kigali, Rwanda. Support their work by lending to a Rwandan borrower! As the Field Support Specialist for Francophone Africa, Kathrin works with Kiva partners to make sure they get the most out of working with Kiva, and to ensure that Kiva responds effectively to partners' changing needs. 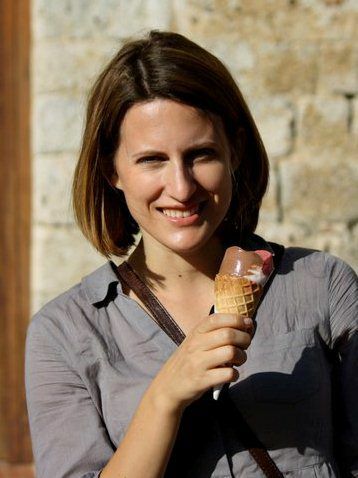 Kathrin previously served as a Kiva Fellow Togo and Rwanda and holds a B.S. in International Trade & Finance. After working at Deloitte as a Senior Consultant for four years, she decided to leave the corporate world to spend a year exploring several countries in East Asia and Africa. Her journey has now led her to Kigali, Rwanda, where she is based when she is not visiting Kiva partners in Francophone Africa. Kathrin is fluent in German and French and she is currently working on her Kinyarwanda.